KISA believes that easy to use technology should be available to everyone. With input from Vision Australia and Guide Dogs Victoria, KISA set out to create a mobile phone that would meet the needs of people struggling with a vision impairment. Whether due to illness or injury, genetics or incident; low vision or impaired visual acuity greatly impacts a person’s mobility and their ability to remain independent. KISA sought to find a way to increase independence and give loved ones peace of mind. 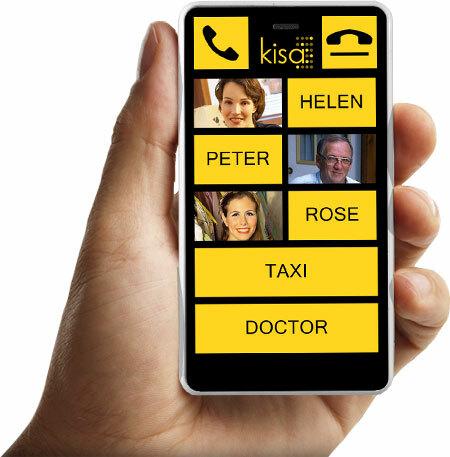 Seeking input from health experts; the KISA phone was developed with large, easy to read print, high contrast colours, dedicated emergency services button, and customisable raised tactile buttons; these design elements make KISA phone the easiest to use phone for those who struggle with their vision. KISA’s high contrast designs make the writing on the phones clear and crisp with high text to background contrast. With several designs to choose from, the KISA phone can accommodate for most individuals that struggle to read the screens of regular smartphones. The large sized fonts used on the phones also help many users navigate the contact buttons easily so they can confidently dial whomever they need. The simplified layout of the KISA phone makes remembering contact button placement easy. 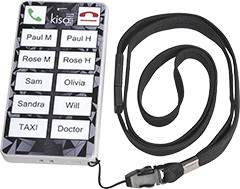 Paired with raised sticker bumps available for purchase with the phone, the KISA phone is perfect for people who suffer from tunnel vision, macular degeneration, and other conditions that lim it field of vision. Every KISA phone also has an easy to operate dedicated SOS button which will ensure that contacting emergency services is easy and uncomplicated. Paired with KISA’s GPS tracking services that shows location at pre-se t intervals, the KISA phone gives you peace of mind and the assurance that your loved ones are safe, no matter where they are.